Malaysians will continue to shop for sought-after items online, such as electronics, home gadgets and clothing apparels as they prepare for Hari Raya. 11street, one of the largest online marketplaces in Malaysia, today reveals that in preparation for the upcoming Ramadan and Raya festival celebrations, more Malaysian consumers will explore buying new items online, such as e-vouchers and groceries, in addition to shopping online solely for items such as clothing and electronics. 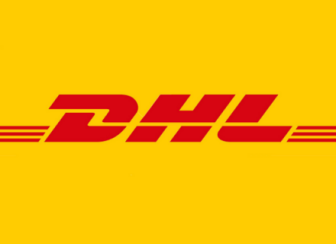 Hoseok Kim, Chief Executive Officer of 11street says: "Malaysian shoppers keep surprising us. During the Ramadan Raya period from 2015 to 2016, we have experienced more than 2.5 times uplift in overall online sales. 11street projects that online sales will continue upward by at least 50% throughout the Ramadan and Raya periods this year, thanks to our customers' evolving shopping patterns." Malaysians will continue to shop for sought-after items online, such as electronics, home gadgets and clothing apparels as they prepare for Hari Raya. According to 11street's findings, there was a significant increase in the purchase of e-vouchers in 2016, upon the availability of more options in the category. Leading to that, the search for food and beverage e-vouchers surged to more than 1.2 million during the Ramadan period for that year. 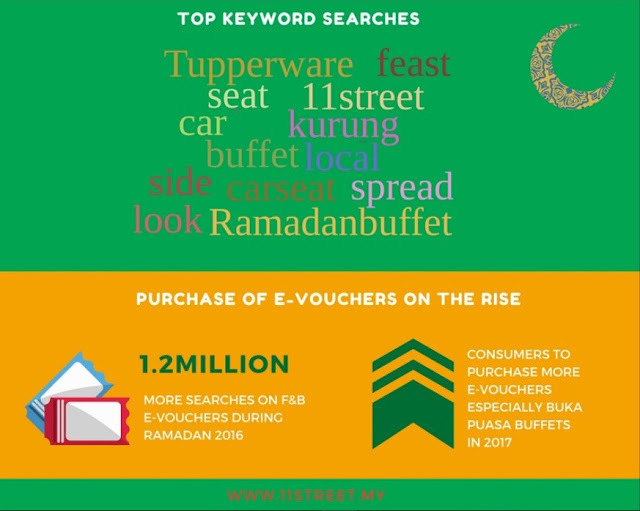 Kim adds: "This year, we expect consumers to purchase more of e-vouchers especially for buka puasa buffets, encouraged by the fact that more five-star establishments and restaurants have hopped aboard 11street to offer their delectable spread. We are constantly evolving to move faster than current online shopping trends, as you can see from our vast offerings. As we amplify our offerings and make online shopping more secure, we see consumers' confidence in us improving, through the purchase of motorcycles on our platform!" 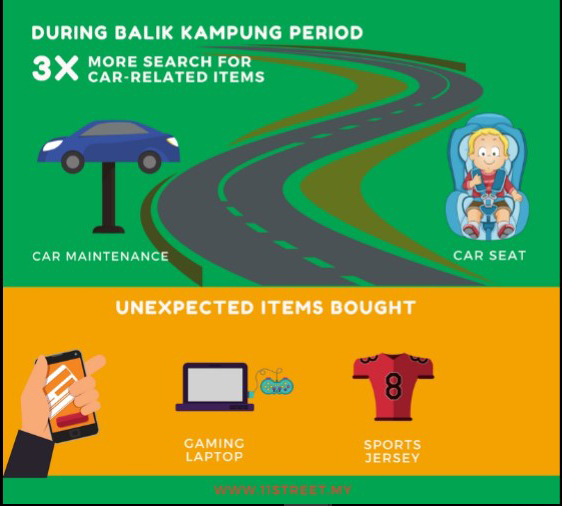 As the Hari Raya holiday period approaches, 11street also anticipates that Malaysians' search for car services and road safety-related items to multiply rapidly as they prepare to balik kampung. Since its inception in 2015, 11street has witnessed at least a three-fold increase in both searches and online sales for baby car seats and car maintenance packages. The online marketplace summarised that these behaviourial patterns were driven by the lower prices found online to combat rising cost of living, and also the convenience of online shopping coupled with the abundance in variety. Interestingly enough, some Malaysians saw the necessity in 2016 to boost their Hari Raya preparation through the purchase of some unexpected items - gaming laptop and sports jersey. Kim further shares, "It is endearing to live in multicultural Malaysia, as everybody celebrates all festivities here. 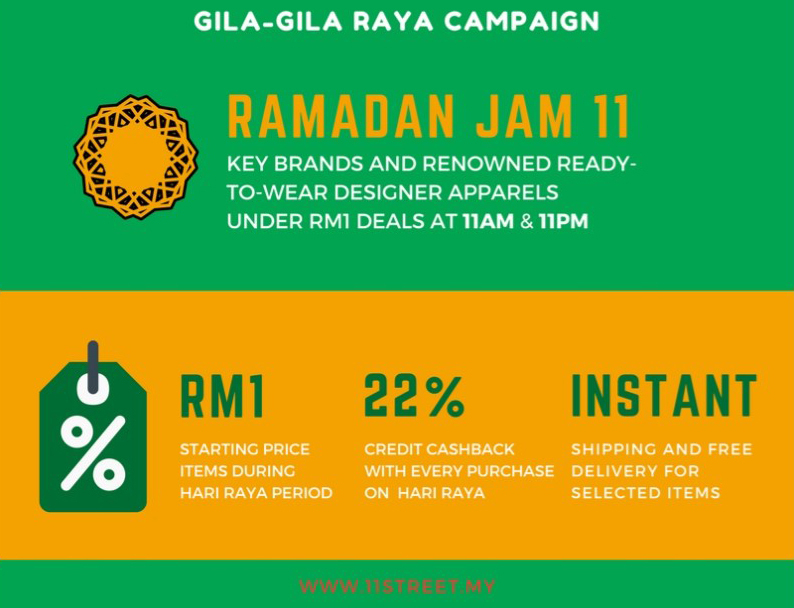 11street is excited to announce our latest campaign - Gila-Gila Raya - with a host of irresistible deals with shocking promotion discounts for every avid shopping shopper out there!" Started today until 23 July, 11street debuts its Gila Gila Raya campaign with a brand new promotion page in English and Bahasa Malaysia, to enable Malaysian consumers to shop for their Ramadan and Hari Raya needs at ease. Pushing full gears into its 'Gila-Gila Raya' campaign, 11street highlights irresistible deals of popular items, key brands and renowned ready-to-wear designer apparels starting only from RM1. Throughout the campaign period, consumers can also enjoy credit cashback up to 22% for every purchase storewide, and instant shipping and free delivery for selected items. Last but not least, 11street's Gila-Gila Raya campaign reaches a crescendo through partnerships with popular celebrity designers such as Remy Ishak, Amar Amran, MariBeli Butik; consumer and lifestyle brands such as Firefly, F&N, L'Oreal, MamyPoko, Nestle, Unilever and Samsung, to offer greater Ramadan and Hari Raya deals. "We are optimistic that Malaysians will continue to turn to 11street as they prepare for Hari Raya. Therefore, we are constantly cognisant of our consumers' shopping pattern, so that we can create stronger promotions that resonate with their needs. After all, we want to make each of their shopping experience on 11street an enjoyable one, every time," concluded Kim. For more information about the 'Gila-Gila Raya' campaign on 11street, please visit here.